Dornan take all elements of environmental health and site safety extremely seriously. As an employer, it is our duty to protect the health and safety of our employees as well as that of our contractors, visitors and any other person that may be affected by our activities. Every effort is made to ensure that both employees and sub-contractors understand and adopt the standardised Dornan EHS principles. Dornan has its own ISO 14001-accredited environmental management system and a suite of training courses on important functions including the safe storage of chemicals, recycling of waste material and procedures for environmental emergencies. Projects are planned to minimise energy consumption, both in the execution of the work and in the procurement of the latest technologies. The company takes pride in the their part played in helping clients’ projects achieve some of the best-in-class BREEAM ratings. The company constantly monitors and reviews the energy consumption in each of their offices. On the road, they maintain a low-emissions, fuel efficient fleet and incentivise their employees to share car journeys. In 2103 Dornan took a specialist approach to reinforce the safety message to their workforce. Upon obtaining the services of a behavioural based Safety Specialist, Dornan set up their own behavioural safety program. Aptly named ‘Dornan Hi5 was created with a strong focus on Ownership, Communication, Interaction, Reinforcement and Acknowledgement. The system is based on incentivising employees to recognise behaviour. 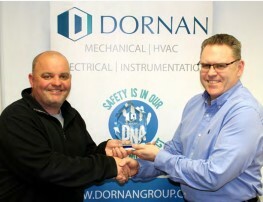 Dornan’s efforts to raise awareness of the importance of recognising best practices, proved successful in enhancing the safety mind-set of their employees and supervisors. We conduct weekly and comprehensive monthly safety audits at all our sites, and encourage all staff to alert us to any concerns. Where applicable, hazards are identified and the level of risk established for each. Our on-site audits are conducted to evaluate compliance and identify any opportunities for improvement. A summary of the audit findings are presented in a monthly Health and Safety Scorecard. We run various incentive schemes to reward outstanding individual and team safety performance. This initiated the recent launch of our Safety Recognition Programme for our high-performing sub-contractors. Dornan Engineering recognises the significance of enhancing the efficiency and performance of our workforce. Our health and safety incentive schemes were piloted and reviewed to ensure fair accessibility to our teams. Our EHS systems and procedures are accredited to – among others – OHSAS 18001, ISO 14001 and SSCP standards. See our full list of accreditations.